The Western Michigan Broncos host the Central Michigan Chippewas at Waldo Stadium on Wednesday, November 1, 2017. The opening line for this game has Western Michigan as 6 point favorites. The Broncos have an over/under record of 5-3-0 and they are 3-5-0 against the spread. 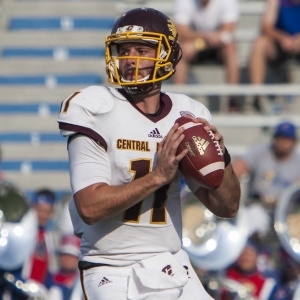 The Chippewas have an ATS record of 3-5-0 while their over/under record is 2-6-0. The Central Michigan Chippewas have run for 1,094 yards as a team, which ranks 94th in college football. They've run 286 times, averaging 3.8 yards per carry as a rushing unit. The Chippewas have been penalized on offense 49 times for 484 yards so far this season, which has them 68th in the country in penalties. They are 86th in the nation in points scored with 206. They have run 601 plays this season for 3,129 yards, which ranks them 48th in Division 1 in total offense. The Chippewas average 5.2 yards per play, which is 100th in college football. As a team they have accumulated a total of 161 1st downs this year, placing them 81st overall as an offensive unit. Shane Morris averages 6.6 yards per pass attempt and 6 adjusted yards per throw. He has completed 170 passes on 300 attempts for a completion percentage of 56.7%. His quarterback rating this year is 122. He has thrown for 1,966 yards this season. The Chippewas rush defense has allowed 338 attempts for 1,537 yards this year, putting them in 93rd place in D-1 against the run. Central Michigan has committed 58 penalties for 495 yards on the defensive side of the ball this season. That ranks them 90th in college football. They are 68th in the nation in points allowed on defense with 216. They have surrendered a total of 3,101 yards on D, which is 63rd in the country. The Chippewas are ranked 39th in yards per play allowed with 5.2. Opposing offenses have completed 144 passes on 260 attempts against the Central Michigan Chippewas defense this season, placing them 59th and 81st in Division 1. The Central Michigan pass defense has also given up a total of 1,564 yards through the air, which is 36th overall in total pass defense. The Central Michigan Chippewas have attempted 9 field goals this season and made 6, which is 102nd in D-1. Their kickers have a field goal percentage of 67%. Central Michigan Chippewas kickers have made 96% of their extra points, going 22 for 23 this year. Their punters have totaled 2,304 yards on 54 punts, averaging 43 yards per punt. That places them 45th in Division 1 in punting average. Central Michigan is ranked 113th in the nation in punt returns with 7. They've accumulated 69 punt return yards and average 9.9 yards per return, which is 35th in college football. They have returned 24 kicks for 424 yards on special teams, ranking 78th in kick return yardage. The Chippewas average 18 yards per kick return and they are 84th in the country in all-purpose yards with 3,622. The Broncos are 30th in the country in points scored with 290. They have run 584 plays this year for 3,333 yards, which ranks them 104th in Division 1 in total offense. The Western Michigan Broncos average 5.7 yards per play, which is 66th in the nation. As a team they have accumulated a total of 183 1st downs this season, ranking them 31st overall as an offensive unit. On the ground Western Michigan has run for 1,885 yards as a unit, which ranks 23rd in college football. They've run 383 times, averaging 4.9 yards per rush as a unit. Western Michigan has been penalized on offense 52 times for 470 yards so far this year, which has them 59th in the country in penalties. Reece Goddard has passed for 12 yards this year. He's completed 2 throws while attempting 3 passes for a completion percentage of 66.7%. His quarterback rating this season is 100.3. He averages 4 adjusted yards per throw and 4 yards per pass attempt. Western Michigan is 73rd in the country in points surrendered on defense with 221. They have given up a total of 3,085 yards on D, which is 62nd in D-1. The Broncos are 70th in yards per play allowed with 5.6. Opponent offenses have completed 159 throws on 268 attempts against the Western Michigan defense this season, ranking them 90th and 93rd in the nation. The Western Michigan Broncos pass defense has also surrendered a total of 1,943 yards in the air, which is 90th overall in total pass defense. Their rushing defense has given up 283 attempts for 1,142 yards this season, putting them in 43rd place in the country against the run. The Broncos have had 56 penalties for 513 yards on defense this year. That places them 96th in college football. Western Michigan is 95th in the country in punt returns with 10. They've totaled 110 punt return yards and average 11 yards per return, which is 29th in D-1. They have returned 23 kicks for 556 yards on special teams, which puts them 32nd in kick return yardage. The Western Michigan Broncos average 24 yards per kick return and they are 48th in the nation in all-purpose yards with 3,999. The Broncos have tried 17 field goals this year and made 11, which is 45th in college football. Their kickers have a field goal percentage of 65%. Western Michigan kickers have made 97% of their extra points, going 31 for 32 this season. Their punters have accumulated 1,540 yards on 36 punts, averaging 43 yards per punt. That ranks them 44th in the NCAA in punting average. Who will win tonight's Chippewas/Broncos college football game against the spread?